Sailing down the Nile River on my way to work in Aswan City, I stopped to reflect before the breathtaking scene unfolding before me: the empowering sun overbearing above, an uncompromising terrain spanning rugged mountains and winding sand dunes with quaint homes dotting in between. These banks were once home to the mighty Pharaohs and Kings of antiquity. I spent a moment to take in the majesty of one of the most spectacular cities I’ve ever visited…for the last time. Up until recently, Aswan’s tourism industry thrived with the influx of local and foreign tourists ready to journey into the ancient past of Upper Egypt. Hundreds of falluca boats line the harbor unused, a clear symbol of the deteriorating political and security situation. The impressive colossal columns, dozens of metres high, decorated with hieroglyphic texts that reveal stories of how people once lived, stood almost abandoned. I could see how these stories and monuments impact the livelihoods of the modern inhabitants of these lands. Now with a skyrocketing unemployment rate from the downturn in tourism, the Aswanese people are out of jobs and have limited means of supporting themselves and their families. The challenge of finding alternative and bottom-up solutions to the youth unemployment crisis in Upper Egypt was only one of the many development issues that I worked on during my one year placement in Egypt with the Aga Khan Development Network. A non-denominational international development agency, the Aga Khan Development Network helps to improve the welfare and prospects of people in the developing world. As with most NGOs (non-governmental organizations), staff and resources are limited. I dove head first into a mountain of work upon my arrival to Cairo last year, where I was primarily based. My main objective was to help raise funds from multilateral institutions and foreign governments, like Canada, to support the implementation of initiatives focused on a broad array of developmental challenges. For example, we managed projects focused on supporting the economic empowerment of women, engaging with traditionally marginalized ethnic communities, and helping farmers use environmentally-friendly agricultural techniques to produce higher quality vegetables. The diverse range of issues that I had to work on was daunting as it was my first time actually working on the ground in a foreign country. Breaking down the all too famous buzzwords such as “gender equality” or “inclusive growth” and making sense of how they are defined in reality and measured, broadened my horizons of what “international development” really meant – both the good and the ugly. For example, knowing the difference between helping people develop local solutions in a participatory way and unintentionally intruding on their way of life can sometimes be blurred. What was perhaps even more exciting for me was the fact that it was my first time living in a foreign country. And not just any country; I arrived at a time when Egypt was undergoing its third revolution in three years. Imagine apartment hunting in the middle of a coup d’etat! But with the support of my colleagues and family, the instability didn’t deter me from pursuing this opportunity. The challenges of living and working in Cairo as a young woman were evident on a daily basis. Whether it was Cairo’s merciless traffic, taxi drivers who drive on the opposite side of the road at full speed, or shop keepers for whom ripping off foreigners feels like a sport – sometimes the daily grind was difficult and overwhelming. But beyond these day-to-day bumps on the road, I could clearly see deeper social issues plaguing the country. As a woman and a follower of the Shi’a Jaffari school of thought, the widespread sexual harassment and intolerance towards minority groups were deeply concerning and worrisome. In fact, I found myself avoiding individual outings because of my discomfort walking the streets where young men roamed. Moreover, despite the recognition of the Jaffari jurisprudence as another valid school of thought by Egypt’s own Al-Azhar University, I felt the need to hide being Shi’a out of fear of persecution following the killings of Egyptian Shi’as shortly after I had arrived in June of 2013. Despite these challenges, I feel blessed to have met some incredibly inspiring people and to have witnessed the amazing history and natural splendor of Egypt. I gained some truly valuable insights into how development is on the ground and the challenges associated with living in an unfamiliar environment. But more importantly for me, personally I hope I can help others overcome some of the limiting cultural expectations placed on young women and the life choices they feel pressured to make. 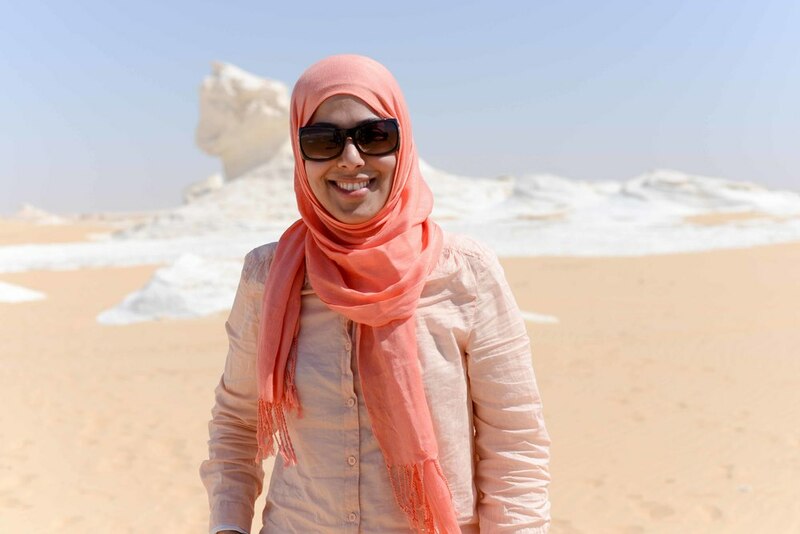 My experience in Egypt can serve as an example for other Muslim women who desire to expand their horizons and pursue their passions while contributing to a higher purpose.